It’s not uncommon for presenters to walk into a conference room for a 20-minute briefing with 40 minutes of slides. On the other extreme, some presenters and public speakers deliver a keynote with none. 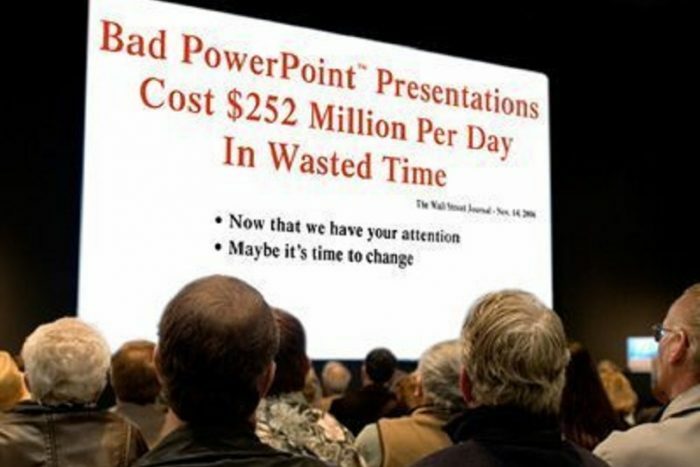 Presenters with large decks will be chastised for mind-numbing “death by PowerPoint” briefings, while speakers with no A-V support will hear feedback that they should add slides to aid retention, increase the pace, and break monotony of their one-dimensional delivery. Confusion on this point is understandable. So how many slides do you need? As with retirement savings, it depends. In my 35 years of coaching people to deliver sales and executive presentations, clients need far fewer slides than they think. Ken starts to put together a half-hour C-suite presentation on Friday. Remembering a briefing he gave a month ago on the same topic, he digs through his master files and selects 20 slides already done. They don’t fit his new assignment exactly, but the data and graphics are relevant. Then he grabs a few slides from another presentation made to a regional group of VPs. Next, he creates a few new slides to make transition points between the merged slides. In other words, the slideshow compilation drives his presentation. He has the data, he reasons, so he might as well show it. After all, the research is clear, persuasive, and well displayed. The only problem? Fitting those 67 slides into a half-hour time slot. His solution? Hide a few as back-up. Then talk faster. And give the audience a copy of the slideshow so they can follow along and review it later if they miss something. Disaster. On so many fronts. Some presentations need no slides at all — The length may limit the use. Physical setting or emotional climate may make slides inappropriate and impractical. For example, you wouldn’t use slides for a wedding toast, for comments from the center of high-school football field or in a building lobby, or for a 5-minute presentation around a conference table. Create slides that ADD to your message — not slides redundant to your words — You personally are delivering your message. Consider adding a slide —a photo, data, drawing, cartoon — to reinforce, illustrate, or further explain. Never just add a slide as your written message. Allow time for your audience to “digest” your slides when you plan and practice your overall presentation —Far too many speakers find they run out of time before they run out of slides! That’s because they did not practice their presentation using their slides, and allowing the time required for a real audience to “process” what’s displayed. That time will come as a big surprise on presentation day! A slide of data may take 5 minutes for your audience to digest while a funny photo may require only 2 seconds. Forget rules-of-thumb about how many slides to use per minute — Common sense has to be your guide about slide count in any given time slot. For example, when presenting to the executive team about profit margins on 6 different product lines that include several products each, a presenter may need to show 6 slides in 6 minutes (with each chart displaying a product line and its corresponding profit margins). But that same presenter may need only one slide in 20 minutes while talking about a new competitor who has recently entered the market. So your rule-of-thumb: Create slides with care, according to your purpose. Then forget about the count.